I have a comparison here. The top arm is from the YZ-2 and it is definitely shorter. Shorter arms, bigger hex... I know some team guys have tried that on the 4wd but not sure what difference it makes to move the width outboard? Which de setup set works on the yok's by the way, see in your pic you are using one? Last edited by DaveG28; 02-11-2015 at 09:35 PM. My Yz was great but side bite just wasn't there ...if you are on higher grip it's great but for me I couldn't drive it hard at all I just had to cruise. You can use the set configured for the B5M. I just have two of them with deep hex inserts that I use for the front and rear. I run on that exact type of surface and have no problem with side bite. What setup were you running? When you put hinge pins in and measure (the proper way), they measure the same length. Ti screw kits are in stock now for the YZ!!!! so foound one these at Baniza place in Japan. 374 shipped. be here next week. Excited to try it out. I see the b5 fronts and rears work fine correct? Anyone working on maybe a carbon chassis? Avid clutchs fit or got to use the RB6 topshaft still? Car is already underweight in some configurations. Topshaft is a different tooth count. Heard there is a company already in works for a topshaft to fit Triad/Nova spurs. Sorry to call it out, but on Jan 26th when I mentioned in this thread that the YZ will pop driveshafts if one runs it at full droop, and to correct it one can run BMax driveshafts, you had commented that you had measured the distance over the pins and the YZ arm was 2mm shorter and that the configuration wouldn't work. So which is it? Upon measuring myself, the YZ arm has a center to center distance that is 1.42mm shorter than a BMax-2 Arm. That's comparing a brand new out of the package YZ arm to a new B-Max2 arm. FYI - I ran the YZ with full droop (plus a little more), with the 62MM driveshafts with no issues using the YZ arms, by the way, and just about TQ'd the first night out with the car. It is very possible that I grabbed the bmax4-iii arm and measured it by mistake. The two rear arms are definitively different lengths. The older arm from the BMax2 is longer. I'm not sure what you mean by proper measuring method. I can only think of one way to measure length from the inside pin to the outside pin. These will be the measurements I use for my notes. Last edited by WillS; 02-12-2015 at 09:08 PM. For future reference. This could be a good tuning option. YZ-2 owners can try the old arms so long as they are mounting the shocks on the rear of the tower. There is a full write up of parts in the BMax2 thread. Check the first page out, we locate all the information on there so it can be found easily. As of right now the gullwings are only possible until an option for the shock tower allows for the flat arms to be used. 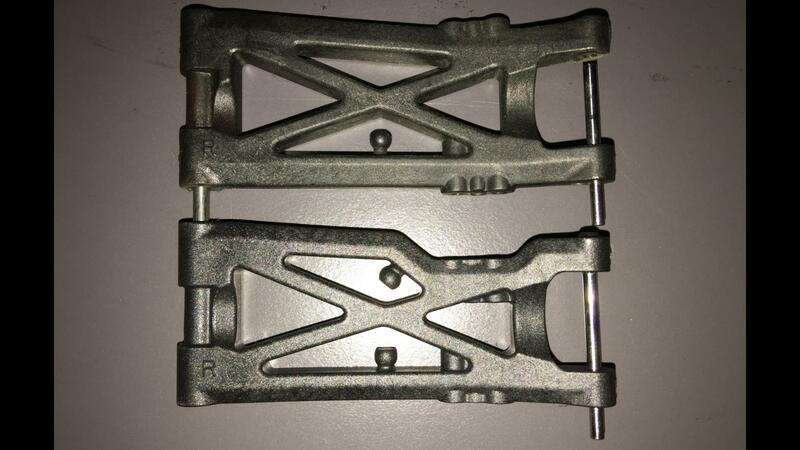 If you notice on Yokomo Europe they now claim the bmax4-iii stock rear arms to be 1mm longer option. They are also optioning the YZ shocks on the bmax4-iii. When the parts get here for the shocks I will be getting them to build up a set for my bmax4 and testing out the improvement that is said to come from them. I really would like to see an option for brass toe blocks. I will just have to wait until Yokomo Europe comes out with them or get a set machined. Might be some coming out soon. I made sure Rocket RC got a few items that he can work on. I will find out time frame after parts get there. Outdrives have been sent out to get machined. Lets hope they are reduced to 10-12g a set. I just hit mip on there facebook page and ask about the 17.5 puck systems. We do not stop email them and ask on facebook. It will take a bit but there get the hint.